A paralysed athlete who became the first person to complete the London Marathon using a robotic suit has set off on a 400 mile bike ride. Claire Lomas, from Melton Mowbray, lost the use of her legs after a horse riding accident in 2007. But she completed the marathon course in 17 days on foot using the specially designed suit. 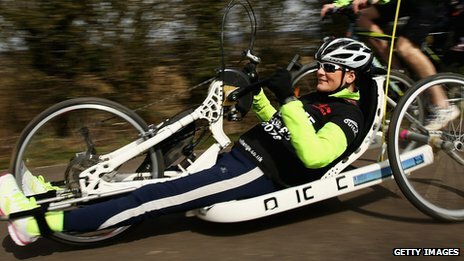 Mrs Lomas now hopes to raise £400,000 for spinal research charities hand cycling from Nottingham to London. During the challenge she will also visit schools to raise awareness about the work of Spinal Research and the Nicholls Spinal Injury Foundation. Mrs Lomas set off from Nottingham Trent University earlier. Win a Day Sail adventure with the Jubilee Sailing Trust!